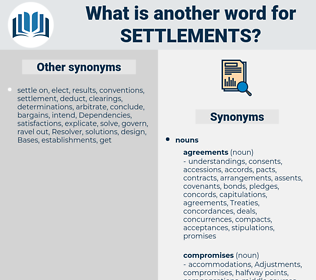 What is another word for settlements? locations, homes, Agencies, places, etablissements, Rights. resident, residents, entitlements, transactions, etablissements, enforcement, dealing, dealings, jurisdiction, household, EMIS, payables, Indemnities, e, forest, Forests, fields, education, forestry, border, boundary, personnel, north, center, centers, commerce, fringe, UNCHS, UN-HABITAT, societal, benefit, benefits, fishery, restrictive, trading, residency, expenses, employee, eating, trade, zoning, Rights, industry, gazette, Fees, living, resolution, diet, feeding, 'habitat, CFI, DFO, social, wildlife, feed, range, sociaux, nutrition, Activities, vehicle, Bis, food, H, DC, HOS, number, non-bank. installments, sets, instalments, elements, disputes, immigrants, complaints, townsites, enactments, commitments, ensembles, accommodations, alternatives, Migrants, administrations, mills, lots, seats, peoples, tenants, Students, Classifications, locations, Municipalities, corrections, points, applicants, Treaties, flats, emigrants, townships, reservations, clusters, results, authorities, slum-dwellers, Households, inhabitants, sections, villages, ways, Addresses, Securities, neighbourhoods, decisions, manned, inmates, museums, Concentrations, favelas, shantytowns, provisions, enclaves, numbers, answers, quarters, statutes, commons, rulings, daughter-towns, headquarters, Tribes, waters, occupants, assemblages, conventions, aggregations, banks, parts, calculations, responses, Assemblies, barangays, tribunals, WEBSITES, restrictions, dwellings, combinations, preparation, disciplines, stands, subdivisions, options, Remittances, clinics, departments, groves, contracts, Killings, Ones, suburbs, hotels, structures, guests, constructs, qualifications, boroughs, provinces, finals, problem-solving, wings, ordinances, statues, Cities, reserves, Entities, farms, preschools, Penitentiaries, introductions, roosts, homes, communes, Associations, others, stocks, plates, courts, Universities, villagers, processor, tiers, SQS, Properties, norms, Stations, Hospitals, fixes, Workplaces, accounts, suppliers, venues, trades, holdings, Prisons, groupings, packages, Rookeries, teachers, plots, demands, complexes, educators, outlets, Locales, huts, Clumps, dwellers, bills, stores, qualifiers, barracks, gatherings, wards, colons, colones, Branches, playoffs, people, Paths, regulators, sides, Trees, regimes, clubs, Companies, Resources, Dependencies, Standards, Agencies, academics, buildings, Undertakings, levels, groups, Lives, Rallies, fixtures, codes, fortunes, frameworks, Foundations, blocs, blocks, approaches, Beds, places, deficits, crowds, meetings, gaps, Bodies, residents, offices, decades, entitlements, transactions, dealings, requirements, Indemnities, Forests, fields, zones, centers, benefits, expenses, Rights, Activities, HOS, arrangements. 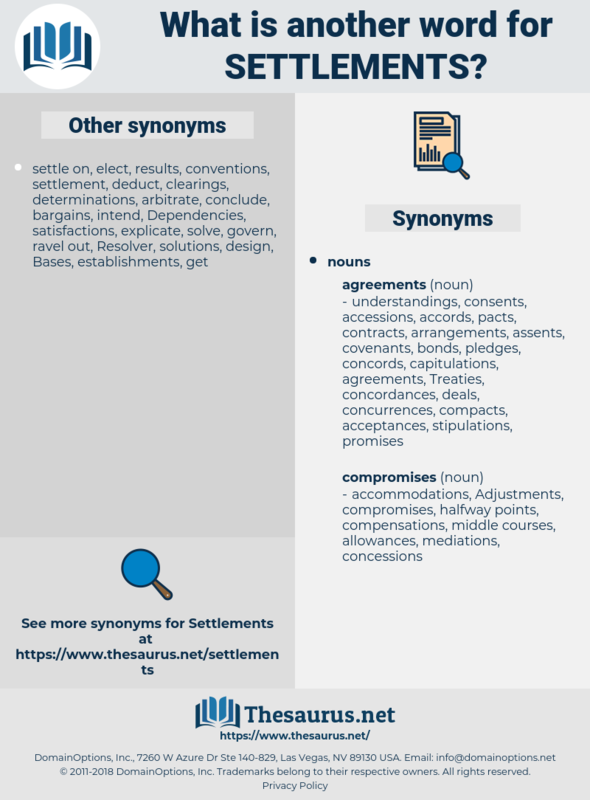 severance, requirements, region, zone, zones, liquidator, corporations, reside, safety, fish, settle, resettlement, arrangement, arrangements, settling, settled, establishment, establishments, regulation, Regulations, liquidation, settler, settlers, colony, Colonies, resolve, solving. reconciliations, encampments, Adjustments, placements, implementations, colonizations, developments, campsites, engagements, operations, hamlets, agglomerations, eliminations, implantations, compromises, relocations, shelters, colonists, conglomerations, liquidations, Neighborhoods, constructions, Slums, installations, estates, outposts, towns, regions, procedures, localities, habitations, residences, Communities, Populations, Territories, CAMPS, Remedies, arrivals, conurbations, orders, Businesses, Houses, schemes, Patches, Policies, Firms, corporations, establishment, establishments, Regulations, settlers, Colonies, solving. Philip neglected and ill - treated his wife's countrymen to the extent of allowing nine thousand of the men on the fleet at Antwerp to die from cold and privation, without trying to help them; his young wife's Spanish household were unpaid, and even the income settled upon her by Philip was withheld, on the pretext that Ferdinand had not fulfilled his part of the bargain agreed upon in the marriage settlements. And we must have respect for its settlements. still-hunt, southland, shetland, sweet almond, stalemated, still hunt, scotland, stalemate.